Our range of industrial label applicators and label print and apply systems can apply labels at speeds of up to 100 labels a minute. Models suitable for 24/7 operations. Remotely locatable LCD control pod. Series 6000 and 7000 label applicators provide a heavy-duty and reliable method of automatically applying labels to product or packaging at user-selectable application speeds of up to 40 metres per minute. These heavy-duty industrialised label applicators are available to apply labels to the top, side, front, front/side combinations and even the bottom of products. Both standard and wide print width models are available allowing labels up to 170mm wide to be printed. Our lowest cost print & apply system. The Weyfringe DB4 is a cost-effective and ideal solution for automatic conveyor labelling of products of most shapes and sizes. Proven in pre-packed and fresh food environments as well as industrial and logistic operations, Weyfringe label applicators are reliable and simple to operate. Supplied complete and ready to run in conjunction with existing conveyor lines or with product handling solutions. Weyfringe label applicators are designed to provide a fuss free and cost effective solution to your labelling requirements. Below is a technical specification overview of our label applicators alongside an example of the different ways and faces our applicators can apply labels to your product. Integration with existing production lines is straightforward and control of data for print and apply requirements can be done via host PC or our stand alone module, ideal for chilled, dusty or other environments where a PC is not ideal. Compatibility with customer's existing communication protocols is made simple as Weyfringe can supply Allen, CAB, Datamax, Open Date and Zebra print engines with their label applicators allowing customers to specify according to their needs. 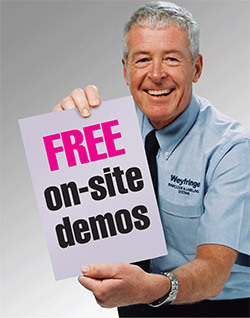 If you need assistance with setting up your new printer or have a fault or issue with any of your equipment purchased from Weyfringe please follow the link below to register your issue and request product support.